There is a saying that ”every 7 years is a cycle”. I am not religious – but I did spend time studying philosophies from different religions and schools of thoughts – and interestingly the number 7 as an indicator for cycles kept coming up. This is interesting to me. Whether you believe in such numerology or not, I recognize that today, on my 36th birthday, was a moment of rebirth within my fifth cycle, for a decision which took me a year to finalize: my move from New York to Hong Kong after working and living for all of my adult life in America. Those who know me for long know that I have traditionally been very active in social media – be it on Flickr, Twitter, Facebook, SoundCloud, Tumblr, FriendFeed, YouTube, Vimeo – basically as someone I met on these social network said, I am everywhere. But if you look at the year before July 2012, I could not be found on the internet. I tweeted a couple of times mostly as an ambient device to let people (mostly my family) know that I was not dead, but that's about it. I did this because I wanted to not have any outside influence on my decision. I wanted to make sure that it makes the most sense to me. But to tell you why I made such a drastic decision, I have to tell you a little bit of myself. As a gay man growing up in Hong Kong, I remember crying every single day after school in private – there was not a single day that I was not bullied. When I was accepted to Yale, I got excited because I thought that if Yale truly lived up to the popular claim of “one in four and maybe more” then I should be ok. It turns out that although Gayalies was a nice support group, my being Chinese was not that awesome within the predominantly WASP presence. I was invited to some Asian American functions but because I was gay, I did not feel welcome either. As an art major with close to none art background, I was not much of an item. Being a programmer almost automatically labeled me as a non-artist. When I took an interaction design class at the MFA program, I focus on making the programs work and not how pretty they are – it was completely dissed. I also recalled telling my graphic design professors that I had a great time the summer after my sophomore year (1997) working at Agency.com and they just gave me a disapproving look and questioned why I would want to do web design which was (and probably still is) ‘99% garbage’ anyway. Even after I started working for an interactive agency, since I prefer PC (at the time) over Mac (seriously OS9 is crap, sorry), I don't really fit in. The IT department thought of me as a trouble maker and annoyed their software licensing process. And if you think that coming out to your parents is difficult (I did that when I was 14), try coming out as a PC user at an AIGA event. I also had a lot of trouble explaining what is that I do – I use programming as part of my prototyping process to design interaction – which I felt and do still feel is the only way you can design interaction – to experience what you design as you refine over time. Storyboards just don't cut it. People like to place me as either category, but I am neither and I am both. It was very frustrating. I am thankful that over time I have met some people who became mentors to me because they understand me, but they are also far and few between. As a minority in a minority in a minority, I have never felt my voice heard. I struggled my entire life but I also accepted that reality that I would simply be a loner. I am ok with that. Fast forward to the summer of 2007, I was invited to cover the gay pride parade for a company. Since I was already there, I also took the opportunity to photograph everyone else in the event. It was a very emotional experience for me. Before then I had long disregarded the gay pride as a complete marketing machine. But after that day, I truly understood why so many gay men and women choose to march down sixth avenue every year – the joy of being accepted. On that sunny afternoon, the streets were packed. It was a city-wide party. People all over the tri-state area came to New York. They were cheering in ecstacy. Yes I know they were probably cheering for the hot guys and gals wearing close to nothing :) but it doesn't much matter. For the first time, I feel accepted. If you had not been accepted for who you are all your life, you would understand how it felt. I have never experienced that until then. Later, I created a Flickr group called Life Celebrates Diversity (Twitter) so people who do not feel heard can have a voice. As I started doing more photojournalism and started blogging about art, I suddenly recognized that there are a lot of artists around who do not have much media exposure because they are simply don't have the know-how to gain the social media klout. 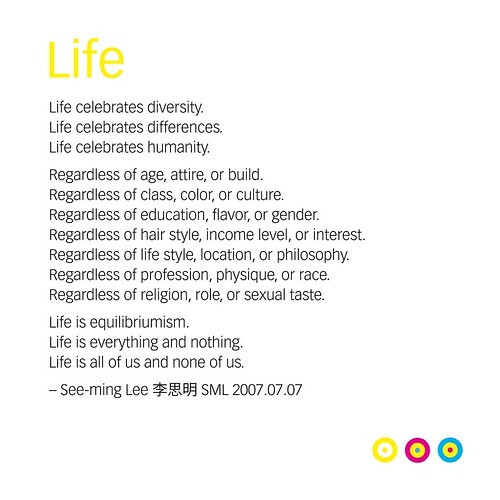 I have long been interested in network theories, and I enjoy using social networks and for a large degree Google as a testbed for network theory experiments, so I created SML Fine Art (Twitter), a Flickr group with the mission to preserve the diversity of art – be them small, medium or large. All of my Flickr groups have a common objective and guiding principal: it sets no limits – no one is there to ‘curate’ the content. Life doesn't pose a limit on us, so who am I to set a limit on others? Subsequently I have created many others: SML Graphic Design (Twitter), SML Viz (Twitter), etc – all areas where I am interested in. I created them so it accepts everyone. It was also a really great way for me to notice works of interest and subsequently gave me the opportunity to meet them in person. Since I belong to a ton of visual social networks anyway, I am more than happy to post things of interest to FFFFound, which get tweeted, and auto-post to Tumblr and basically let things sip inside the social net – a process which a friend called the ‘incestuous reality of any social network’. My hope is that through these networks the work which I believe to be important would at least gain a little bit of much deserved voice. This is what my passion lies: to do what I can to give a voice to the little guys – those whose voice were not heard mostly out of bigotry. I never had a voice when I was younger, and I wish for others that they could have the opportunity to be accepted. I wanted to do this full time for a long time, but I could not while I was in New York. As an ’alien’ in America, I was bound by US law to work full time at a company. As such I joined a couple of startups whose philosophies appear to be in line with mine. Unfortunately, as investments come in and when revenue matters, so did their business plan. They were wonderful folks, but I cannot really work full time at a job which pays me no salary and are not inline with my philosophy. I am grateful and thankful for the experience – I have learned a lot, but I thought that it was time that I moved on and do my own thing. Having my own company allows me to do that. It doesn't really pay much right now. Starting from scratch is difficult. But you cannot measure value with a dollar sign. I have done a lot of freelance in the past in New York for lots of money but it never buys me happiness. I now only work on things which I believe to be meaningful regardless of pay. I am thankful for the support of my family to allow me the luxury to realize my dream. Conventional wisdom suggests that doing everything for free generates nothing in return, but my experience tells me that it is far from the truth. There are many things which could not be bought and those are most valuable. Even if we must focus on money, my experience with licensing everything for on my Flickr stream for free via Creative Commons suggests otherwise. It is a bit hard to believe but I actually made money from my CC content because people who had the budget for photography for their projects ended up giving me credits and send me cheques for photo placement. It's crazy. Those who couldn't afford to pay will never be able to pay anyway so what does it matter? In any case, I still do some freelance projects on the side if it's meaningful to me. Money is not a measure of value for me. I prefer bartering – which before the concept of money was invented was how people do business anyway. I also hope to spend half of my time in the next 10 years documenting the change of China through photography as showing Chinese culture in a positive light is important to me. I may not agree with everything that the Chinese government is doing, but as a Chinese, I am proud of my culture. Which is exactly why I don't have an English name. You need not agree with the politics, but the people, the culture and the arts are really spectacular. I also hope to meet the local artists in my journey, as I have seen some really interesting things happening in contemporary art in China. So there you have it. I am in Hong Kong now because after connecting all the dots of what I did in my life, I think that I have found out what I love to do and I want to do exactly that – which interestingly was the same conclusion that Steve Jobs came to while he was still alive. If you wish to learn more about how Creative Commons indirectly helped me gain influence on the social web, check out this article recently written about me where a photograph which almost got deleted from my camera ended up being the most popular photo on my Flickr stream and in turn became synonymous with Twitter when it comes to journalism. English, I had forgotten. Your bio and the ideals you work to exemplify really make your decision to go back to Hong Kong sound exactly right. The chances for you to be productive and maybe even happy sound much greater too. Thanks also for the photos of Prince. Thanks very much for your positive feedback. It's a hard life being different – but it is also wonderful to have the experience to understand how hard life must be for people who are different. I am thankful that it thus allows me to be more open-minded about things which appear unacceptable to me. I worked with a creative director for a few years when I was in New York. He introduced me to mindmapping which has been a really great technique to organize my somewhat ADHD thoughts. You might find that useful as well perhaps?